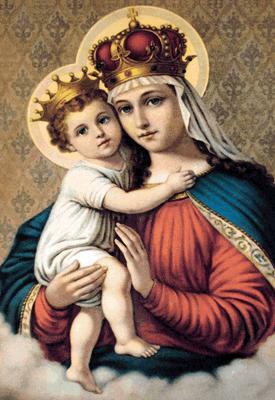 O Queen of Heaven and Earth, Most Holy Virgin, we venerate thee. Thou art the beloved Daughter of the Most High God, the chosen Mother of the Incarnate Word, the Immaculate Spouse of the Holy Spirit, the Sacred Vessel of the Most Holy Trinity. O Lady of Good Remedy, source of unfailing help, grant that we may draw from thy treasury of graces in our time of need. Touch the hearts of sinners, that they may seek reconciliation and forgiveness. Bring comfort to the afflicted and the lonely; help the poor and the hopeless; aid the sick and the suffering. May they be healed in body and strengthened in spirit to endure their sufferings with patient resignation and Christian fortitude. (indicate your special intentions here). On my part, O loving Mother, I pledge myself to a more intensely Christian lifestyle, to a more careful observance of the laws of God, to be more conscientious in fulfilling the obligations of my state in life, and to strive to be a source of healing in this broken world of ours. Dear Lady of Good Remedy, be ever present to me, and through thy intercession, may I enjoy health of body and peace of mind, and grow stronger in the faith and in the love of thy Son, Jesus.